Some people say that Shanghai night is glamorous. Especially, The Bund, the area along Huangpu River, is one of the best in the city. The European style-stone architectures, which most of them were build almost a century ago, look somewhat masculine, but once the sky darkens and orange street lamps lit, you are now exposed to their softness, which were hidden inside of these architectures. 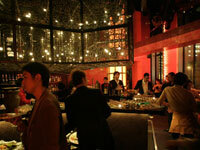 In such a glamorous area, where you can enjoy Shanghai's marvelous-ness, 2nd day's get-together party will be held. A restaurant bar, "De La Coast" is housed at one of the city's designated historic architectures. The top floors, 5th and 6th floors were renovated for such use. 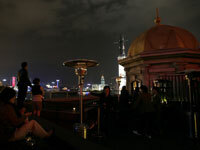 On the terrace, people can see Pu Dong Area's skyscrapers in front, and on the different direction, there's The Bund, the glamour of Shanghai. "The focus of this restaurant design is a night view. I tried my best to differentiate the view from De La Coast and the neighboring restaurants." 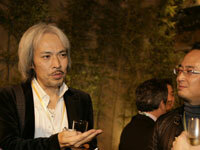 The designer of the restaurant, Mr. Norio Ogawa, of infix, says. infix is a Osaka-based design firm, and opened its Shanghai Office in 2003. 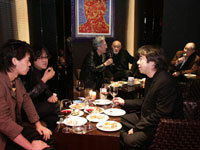 They have been designing many properties in Shanghai, including a live house and restaurant. "The 5th floor is surrounded with red. It is a view, intended to be seen from a window. The 6th floor is surrounded with black. It is a view, intended to be seen from the outside." Some of the guests couldn't hide saying "wow" when they first got off from an elevator, and exposed to the red and the window-views. At 19:00 o'clock, The Bund simply changes. That's the time when all the buildings in the area begin their light-up. Due to the wind chill factor from the river, not many people are on the 6th floor at this moment. It seems that many people are still enjoying the view from the window now. While standing alone on the 6th floor, and looking over the skyscrapers, some people may think "Am I really in China?" "Shanghai, Tokyo, and New York, all these cities don't quite represent its country. I feel Shanghai as a country itself." Mr. Tei Shuwa of INTENTIONALLIES, a design firm says. Mr. Tarumi of Ladakh Design Associates has a similar opinion. 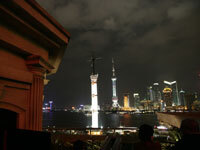 "Shanghai is like New York City, where the city's characteristic is very distinctive. 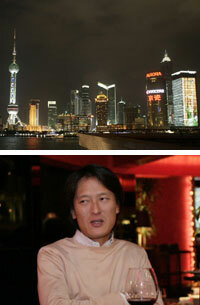 I consider Shanghai as a city, rather than a country." In the near future, will Shanghai be a one of Chinese cities? Or will it be creating a new cultural area called the greater Shanghai? People are curious to know which way it will drift. It's 20:00 and people began to gather on the 6th floor. One third of the floor is a rooftop terrace and people can enjoy 270 degrees view of the Shanghai nightline. Some of them are enjoying a glass of wine, view, and conversations. "I think it's a very fascinating city. Many people with different background gather here, and it's nice to see a good mix of culture." Mr. Nakajima now operates one of the largest restaurant chains in Japan, and his first restaurant happens to be a Chinese restaurant. "If there is an opportunity, I would love to start a restaurant business in here. Currently, many Shanghai shops and restaurants have New York Style interiors, and I think if more of Japanese essences are introduced to the city, I think the city will flourish even more. Now is the time Japan can go with the original Japanese style." Mr. Ryu Kosaka, NOMURA Co., Ltd., agrees Mr. Nakajima's opinion. "I think Japanese design is demanded from all over the world. The quality is one of the best. Japan has a great culture of own but design and fashion elements have been imported for a long time. I think now is the time for the main dish and Japan should make more appearances in overseas." Mr. Kosaka is an in-house designer of a company but recently, he relocated his design section's office to outside the headquarter. He is willing to accept more work from the overseas clients. It's after 21:00 and designers once again departed to the night life of Shanghai. Before they left, people were shouting, "Spicy crab hot pot!" Designers are the ones who create a dining space and it is important for them to intake as much as dining opportunities possible. After all the guests left, the local guests begin to come in to the restaurant. I'm sure that they have no idea of knowing that Japanese designers were gathering here a moment ago. But in the near future, there could be a place for a "reunion" through architectures and shops, which Japanese designers designed in Shanghai. That ultimately means "Through the photo book." "Through Interior Design // Japan."